I guess my question for you is, why wouldn’t you want to study abroad? A new country, a new place, new people, new scenery, new things to do, a trip that will change your life and world perspective – studying abroad is all of that, and more. When I decided I wanted to study abroad, I felt like I needed a change of pace. I am from Massachusetts, so Rochester isn’t too different from where I grew up – it is still the northeast USA. What I wanted more than anything was to immerse myself in something new, something different. When I first entered college, study abroad was always something I said I wanted to do, but never thought would really happen. I thought studying abroad was only something super motivated, super rich, or super lucky people got to do. It seemed like a far off mysterious dream. But, I’m going to let you in on a little secret: none of that is true. When it comes to studying abroad, the University of Rochester is on your side. Believe it or not, my 5 months in New Zealand, minus side trips I did for fun while I was there, cost exactly the same amount as it would have to stay at Rochester for a semester. Through a combination of financial aid from the University and IES, as well as a scholarship that I received from IES, I was able to cover the cost of my trip with only a relatively small amount that I had to contribute for personal travel while abroad. While this may not be true for everyone, there are an incredible number of resources and scholarships out there to help you study abroad. I personally worked closely with Ted Pagano (he works in the Center for Education Abroad office); Sam Hudson, the IES link between the University and Christchurch, New Zealand; and Eunice, the resident “mom” of the Christchurch IES program. Each IES abroad location has an IES figure who lives in your city and whose job is to help you acclimate to the new country, school, and culture. (Eunice was absolutely amazing and organized a number of special trips and cultural experiences around Christchurch). Similarly, each IES program location has an IES member whose job is to help you out with paperwork, visa applications, and other important deadlines. For me that was Sam Hudson, and he was invaluable in the process of getting ready to go abroad. Studying abroad, in many people’s cases, is much easier than you may think. I decided I wanted to study abroad at the end of my freshman year. So, I looked at my course schedule, found the courses I absolutely had to take the semester I wanted to study abroad, and searched on the IES abroad website for similar courses offered in countries I was interested in. I went abroad my sophomore spring semester. (While most people go in their junior year, I really wanted to take my junior fall course load at Rochester). The semester I was away, I had to take one engineering course (Fluid Dynamics). Finding an equivalent fluid dynamics course to take abroad was the hardest part of setting it up. But, I started talking with the professor in charge of approving the course early (one semester before I left), and it worked out well. Many professors want you to study abroad, and are willing to help with course approvals. Although I only had to take one engineering class abroad, I ended up taking two other classes (computer science and biology) that count for my major. I didn’t decide upon taking them until I got to New Zealand, but getting approval for them (especially because they were intro courses) was very easy. The last class I took was called Maori history. I took it as an elective in order to learn about New Zealand traditions and the background of the Maori people. That was my favorite class by far, and learning about the history of Maori New Zealand gave me invaluable insight into the culture. If you study abroad, I highly advise that you take one fun class, even if it doesn’t give you any credits back home, and learn more about the country you are in! Studying abroad in New Zealand was amazing. I cannot put into words how glad I am that I went. 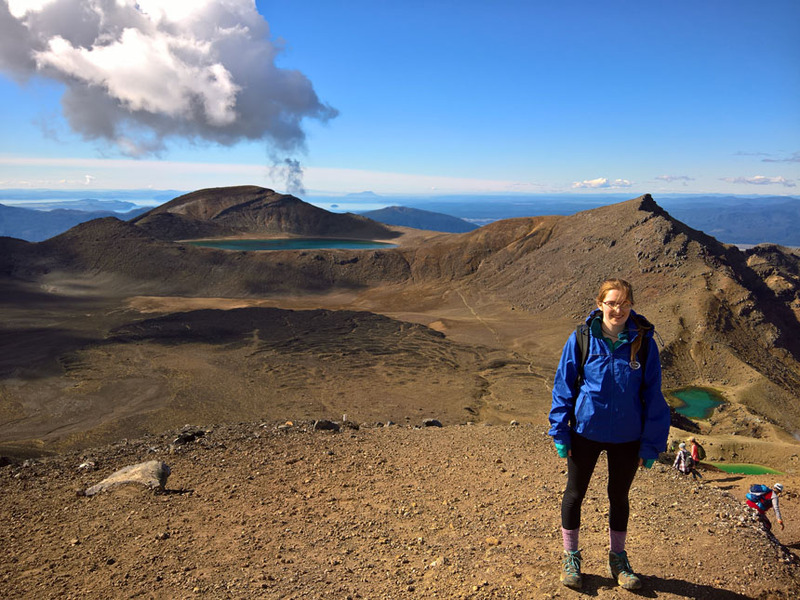 In my study abroad search I was looking for an outdoors-based experience, and New Zealand was perfect for that. At the pass, we hiked along a river for 6 hours and set up camp by a forest overlooking a valley. In the afternoon we explored the river, and found startlingly blue pools of freezing water that was clear enough to drink. For the next two days my feet throbbed and my shoulders ached, but that was the trip that got me hooked onto tramping. 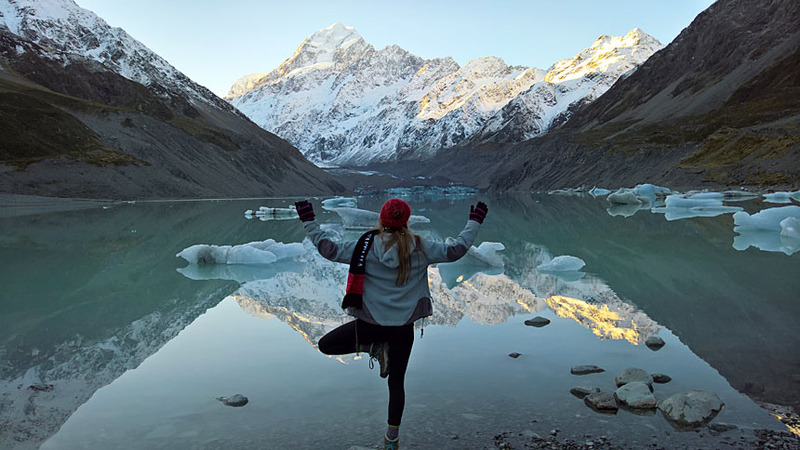 Some of my other favorite moments from studying abroad include a trip I took to Mt Cook, the highest peak in New Zealand (see photo above); going to Cathedral Cove, which is where a scene from Narnia was filmed; going to Hobbiton (I am a huge Lord of the Rings nerd); and doing a 24km day hike called the Tongariro Crossing (see photo below). If you want to study abroad, my advice to you is this: do it! Start trying to get course approvals now for the courses you absolutely must take, and go talk to the Center for Education Aboard office – they are some of the nicest people on campus, and their job is to help you get to where you want to go. Look online for scholarships, and talk with your financial aid advisor to see what your financial aid will look like if you go abroad. When you get abroad, join clubs, take fun classes, and TRAVEL. Most importantly though, if you have any interest in studying abroad, the only thing to do is to just do it!